A set of 15 icons commissioned by *drazzi (lovely to work with as always!) 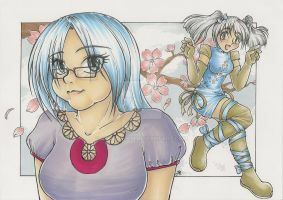 of her character Nel for use in an RP journal on Livejournal. I believe the garland on her head is something to do with the RP itself. makes me wish i could order stuff from the interwebs. The FLAIL one is amazing XD; Yawm is kinda... hot. XD And and the falling down one is just PERFECT! <3 Nyaaa! SO much love!!! I'm really pleased that you like 'em!